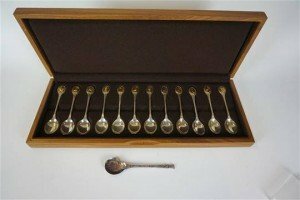 A set of twelve hallmarked silver commemorative spoons to represent The Royal Society of Protection of Birds, designed by John Pinches, made by Great Crested Grebe London 1975-76, fitted in original box. 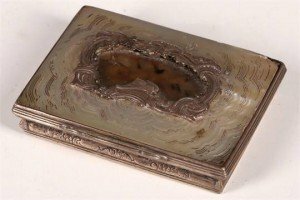 A 19th Century silver snuff box, mother of pearl ‘cloud’ top with open scroll insert, mother of pearl base with floral decoration. 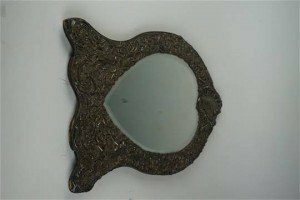 A late Victorian hallmarked silver easel dressing table mirror repoussé decorated with cherubs and foliate surrounding a vacant cartouche. 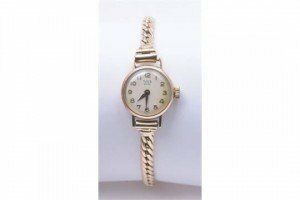 A Vintage ladies 9ct gold Tudor Royal manual wind wristwatch, the cream Arabic dial to circular 9ct gold case and 9ct gold curb link bracelet. 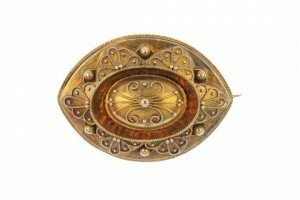 A late 19th century 18ct gold memorial brooch, of marquise outline with cannetile rope-twist and beaded decoration, to the arranged hair panel reverse. 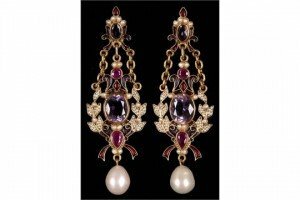 A pair of Italian 18ct gold pendant earrings by Percossi Papi, with amethyst, rubies, pearls and enamel decoration. 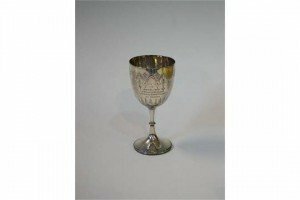 A Victorian hallmarked silver chalice, having Gothic chased decoration having engraved inscriptions, raised on single knop stem above cast beaded rim. 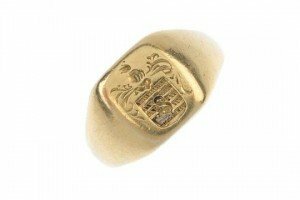 A gentleman’s early 20th century gold intaglio signet ring. Depicting a swan over a shield, with scroll and swan top, to the tapered band. Ring size R1/2. Weight 12.9gms. 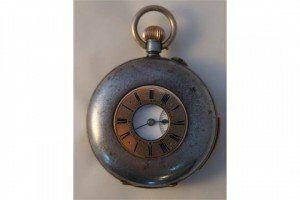 A Continental 800 grade silver open faced pocket watch, the white Roman dial with outer minute dots and subsidiary seconds dial to 6 o’clock, the case extensively decorated with meandering scroll work and foliate repousse. 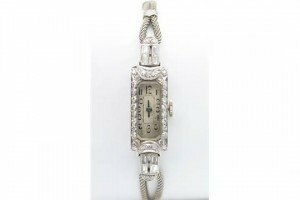 A circa 1920s diamond and platinum cased cocktail watch, the cream rectangular stylised Arabic dial with geometric inner minute track, the bezel completely set with round old cut and eight cut diamonds, to baguette cut shoulders, and white metal meshed rope bracelet and stamped 9ct clasp, total diamond weight estimated 1.26ct. A pair of topaz and diamond ear pendants. 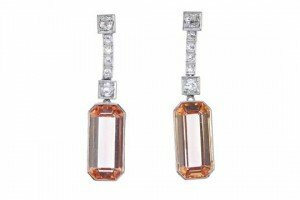 Each designed as a rectangular-shape orange tourmaline, to the old-cut diamond articulated surmount. An opal and diamond ring. 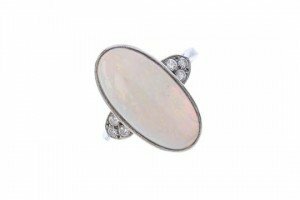 The oval opal cabochon, with brilliant-cut diamond trefoil sides, to the tapered band. Estimated total diamond weight 0.20ct. 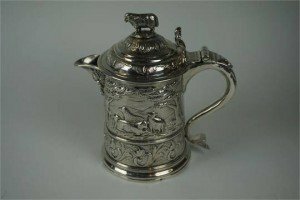 A Victorian and later silver lidded tankard of tapered cylindrical form with scroll loop handle and acanthus thumb rest, adorned with a mask spout, domed cover and ram finial, chased and engraved with scrolling foliate designs. 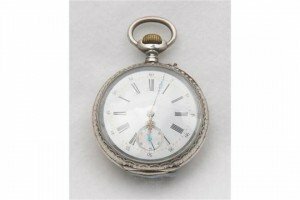 A late 19th century nickel cased half Hunter quarter repeater pocket watch, the white Roman dial with outer minute track and subsidiary seconds dial to six o’clock, the half Hunter case with applied golden blue enamelled Roman chapter. 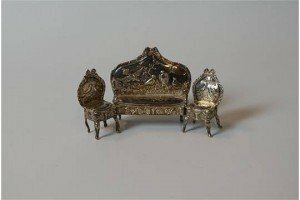 An Edward VII hallmarked silver three piece dolls house miniature suite, comprising a two seater sofa and two chairs, each with repousse decorated with birds in foliate. 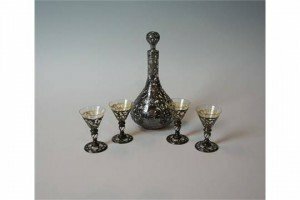 A fine quality late Victorian white metal mounted glass drinking set, comprising decanter, stopper and four glasses, the decanter having engraved initials. 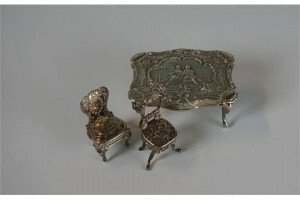 A late Victorian hallmarked silver dolls house miniature table, repousse decorated with figures in landscape, raised on cabriole feet, also two chairs. 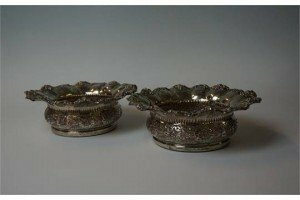 A pair of good quality 19th century silver-plated wine coasters, having cast decoration of grapevine and foliate. A pair of emerald and diamond cluster ear pendants. 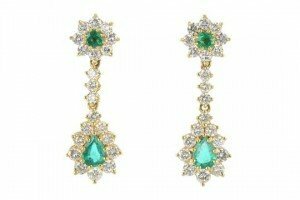 Each designed as a pear-shape emerald and brilliant-cut diamond drop, suspended from a a brilliant-cut diamond trio, to the circular-shape emerald and brilliant-cut diamond cluster surmount. Estimated total diamond weight 3cts. 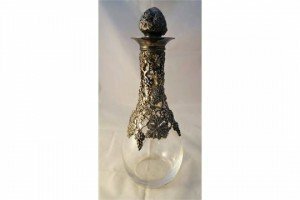 A good quality hallmarked silver mounted decanter of baluster form, the silver decoration cast with grapes and vine leaves.